When I grew up, I never wanted to be an alcoholic or heroin addict, my goal was to be a professional barefoot water-skier. Today, I am a humble servant of GOD. 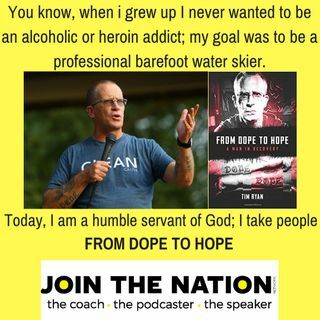 I take people from Dope to Hope! Tim Ryan and I, Stewart Michaelson discuss his addiction, his recovery and the journey he follows everyday trying to help those still suffering. Raise your hand and ASKME4MYHELP!